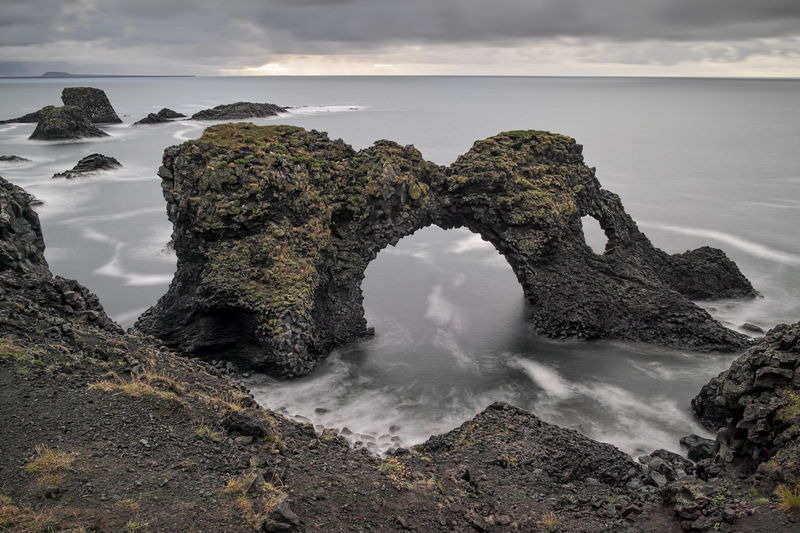 The Snaefellsnes Peninsula, and in particular the coast near Arnarstapi, was one of the (not so few) places in Iceland with too many tourists, for my taste. This is why I sneaked out of our room early in the morning, while the rest of the family was still sleeping, and went to see Gatklettur all by myself (and with my camera and tripod). The scene was beautiful: the sun had just risen, the wind was blowing, it was raining only far away, and I was the only person there. Although I am not particularly fond of my landmark photographs, I am rather satisfied with this composition; also because for once I was "there" at the right time. You should be able to see this photograph much larger than usually. Last week I have lamented the small display, in particular of panorama compositions, on my blog and website. While the width of my blog template is still restricted (and will stay that way), the website should now display full size photographs - much more impressive than before! Please go and have a look at the landscape gallery; and if you want let me know what you think. All the best and a good start in the new week!